Housed in a wall-mount, watertight plastic enclosure, the DPS3300 Series scanners offer highly functional multichannel scanning with a number of very useful features. Tasks that formerly required multiple monitors can now be accomplished by using a single unit. Signals from 7 different transducers are carried into conveniently located screw terminals that are accessed through a sealed plastic cover. The unit automatically scans each channel, displaying the channel number and its process reading. Signals from thermocouples, RTDs, and thermistors are linearized and can be displayed in °C or °F. Current, voltage, and millivolt signals are easily scaled for indicating the process in specified engineering units. Up to 7 different processes can be displayed on a single scanner, and each channel can be assigned a 3-digit, alphanumeric engineering unit (psi, ft, etc.). 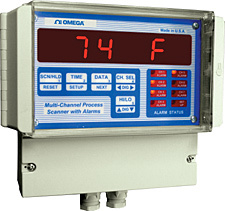 Channels are sequentially displayed for a programmed length of time; with the hold feature, the display can be held indefinitely on any one channel. The DPS3300 has multiple display modes and can be programmed to scan all channels, display the channel with the highest or lowest reading, process deviation from a pre-programmed setpoint, and display differentials between channels. The DPS3300 can also run merely as a timer. Additional features include min/max readings and rate of change for all channels (from a pre-programmed setpoint). A control relay or open-collector output for each channel is available as an option. A built-in buzzer (available with output option) sounds an alarm whenever a limit is reached. Visual indication of relay output status is given by LEDs. Open Thermocouple Indication: "HELP" displayed.